US Deputy Attorney General Rod Rosenstein is heading to the White House amid reports he is expecting to be fired. The development follows a report that America’s second most senior law official last year talked about ousting Mr Trump and secretly recording him. In a radio interview aired on Monday, Mr Trump said he had not decided whether to fire Mr Rosenstein. Mr Rosenstein oversees special counsel Robert Mueller’s Trump-Russia inquiry. A source close to Mr Rosenstein said “he’s expecting to be fired”, Axios reported on Monday. On Friday, the New York Times reported that Mr Rosenstein had discussed recruiting cabinet members to invoke a constitutional clause providing for the removal of a president if deemed unfit for office. According to the newspaper, the deputy attorney general had also suggested surreptitiously taping the president in order to expose the chaos in the White House. Mr Rosenstein denied the claims, and a Department of Justice spokesperson told the BBC the secret recording remark was just a joke. The deputy attorney general was said to have made the remarks after Mr Trump fired FBI Director James Comey in May 2017. 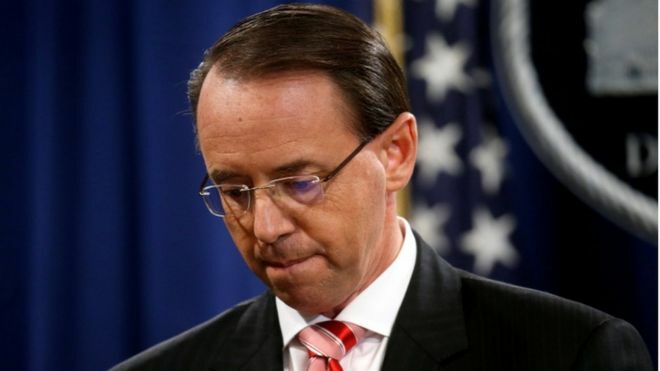 If Mr Rosenstein is fired, it will probably raise concerns over the fate of Mr Mueller’s ongoing investigation into Russian meddling in the 2016 election.